While the Arctic may seem bleak and inhospitable, indigenous people have successfully lived there for thousands of years. In this issue, learn how the Inuit of northern Canada, Inupiat of arctic Alaska, and Sami of northern Europe survive in a harsh environment. Discover lessons, informational text, and children's literature that introduce your students to these groups and their cultures. Learn how to promote metacognition, connect with other classrooms, and embrace your students' diversity through Culturally Responsive Teaching. 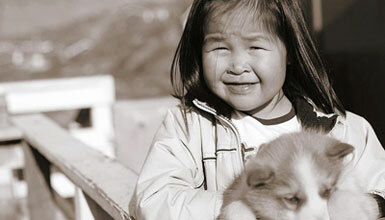 Photo: An Inuit child in Ostgronland, Greenland. Photo courtesy of Nick Russill via Flickr.